Start any rehabilitation program for your body with rest, until the pain and swelling are reduced. Ice three times a day for 20 minutes with an ice pack you can make at home. Mix water and alcohol in a ratio of 2:1 (2 parts water to1 part alcohol) in the bowl using the measuring cup and something to stir with. Pour the right amount of mixture into Ziplock size of choice. @ cups water and 1 cup water fills a quart size bag. Zip up bag after expelling any excess air. Place this bag inside another Ziplock bag to prevent leaking and zip outer bag to prevent leakage.You can even triple the bags for leakage and ice burn safety measures. The isopropyl alcohol will prevent the water from freezing into a block of ice and allow you to form the bag around your injured body part. 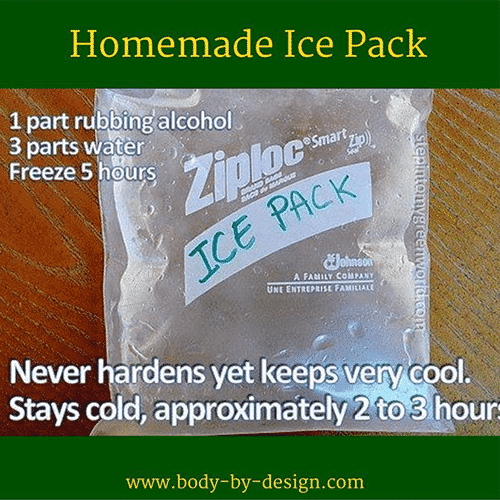 This bag of ice will also stay cold longer than most store-bought ice packs and can be reused over and over again. You can use an old t-shirt, dish towel or cloth of any kind to make a pouch for the ice that will protect your skin. Use an Ace wrap to secure the ice pack so you can continue todo your activities of daily living. Soak bandanas in the alcohol and water mixture. Ring out and store in Ziplock freezer bags in the freezer. Use soft frozen bandana around neck or other body part. Instantly refreshing! Never Hardens. Stays Cold 2-3 Hours. Conforms easily to Body Parts. I am always running out of store bought ice packs. It is great to know how to make them quickly myself! Thanks Karen for the idea.